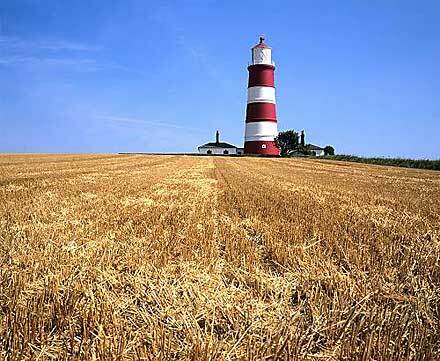 Happisburgh (pronounced Haysburra) is a small coastal village of some 1300 souls. It is situated on the B1159 coast road between the villages of Walcott and Sea Palling. Its delightful red and white banded lighthouse can be seen from miles around; as can the 110ft tall tower of the village’s impressive St Mary’s church. The church is perched on the clifftop and the surf can be clearly heard pounding on the beach just below the graveyard. This church is one of those that certainly has an atmosphere about it. A friend who is something of a psychic told me that the church and its surroundings have a very powerful ‘feel’ that is quite unsettling. If you visit it is worth a walk around the churchyard as the headstones reflect the loss of life that has taken place off the coast of Happisburgh over the centuries. This stretch of coast was notorious for shipwrecks and many sailors washed ashore on Happisburgh’s beach are interred in the churchyard of St Mary’s. The graves of some casualties of World War II that lost their lives off this coast will also be seen. 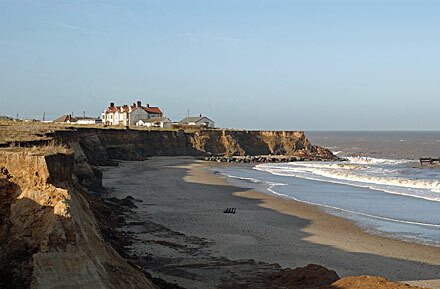 Sadly, some of Happisburgh has been lost to the North Sea due to coastal erosion. Owing to lack of investment in sea defences by the authorities over the years this problem is ongoing and the effects are there for all to see. Many of the properties on Beach Road are now under serious threat and some have been abandoned. The bungalow in the right of the photograph is one of the few holiday dwellings left on the clifftop. Other chalets and static caravans that were once enjoyed by holidaymakers over many summers, have either been demolished, removed or lost to the sea. A positive point is the recent addition of a new pay and display car park and toilet block at the end of Beach Road. This is very convenient for users of the excellent bathing beach that is easily accessible from the car park. The public house in the village centre is called Hill House. It is a traditional pub dating back to the 15th century. The last time I visited it was still a no-frills Norfolk pub serving good beer and bar meals. It attracts mixed reviews.